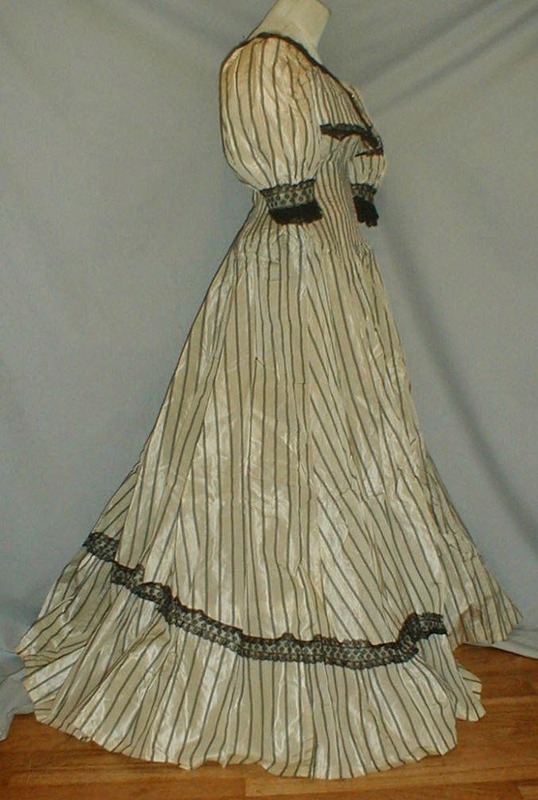 A striking 1895 Belle Epoch white and black stripe evening dress. The fabric has a black stripe designed with a lace pattern on a white background. 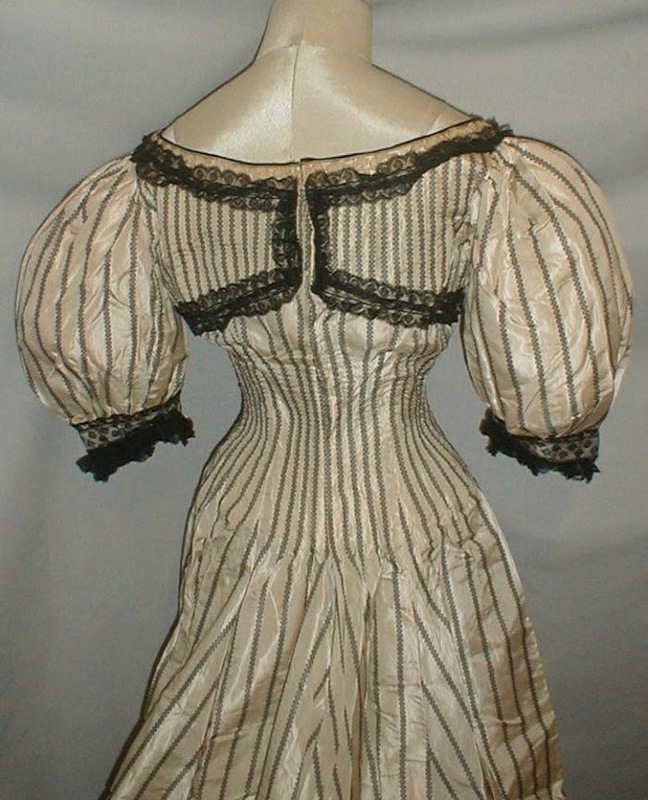 The bodice has leg of mutton styled sleeves that are trimmed with black lace. 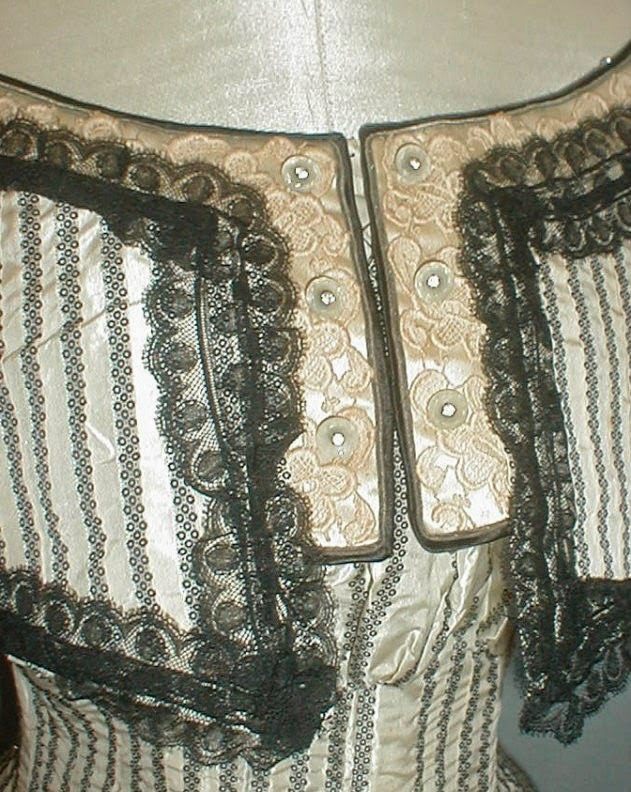 The bodice has a faux bolero style front and back. It is trimmed with black lace. 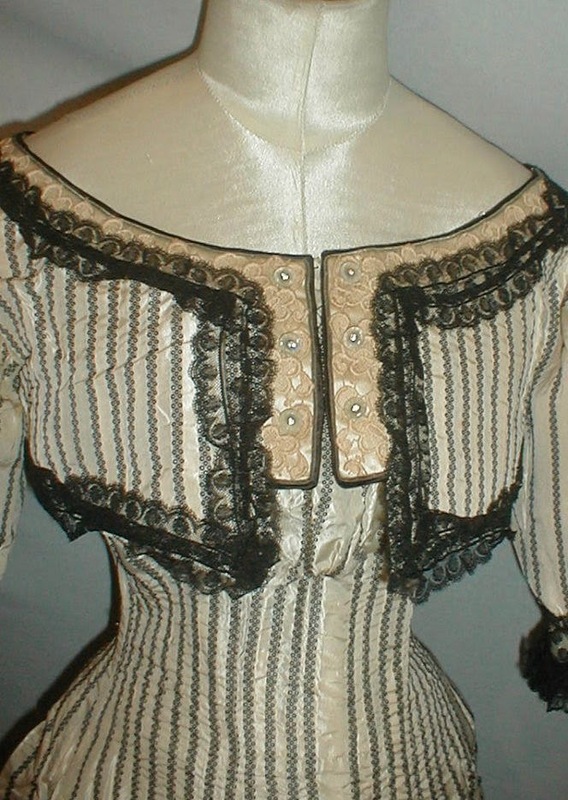 The neckline is trimmed with beige lace and decorative buttons. The skirt is trimmed with black lace. The bodice is lined with cotton and the skirt is unlined. The dress has a back hook and eye closure. It is in very good and sturdy condition. There are small area of light underarm discoloration, a few pencil tip size holes and 2 small pea size age spots. The dress is for display ONLY. Bust 32 Waist 24 Skirt length 38. The dress is from almost a decade later than the seller claims. 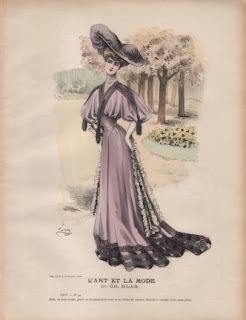 Here are some similar fashion plates from 1903. 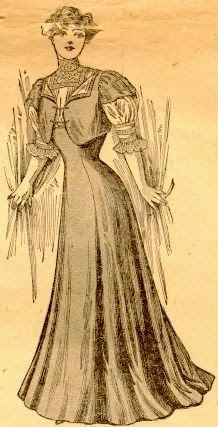 People get confused by the poofy sleeves I think, automatically thinking 1890s and forgetting the early-mid 1900s big sleeves. 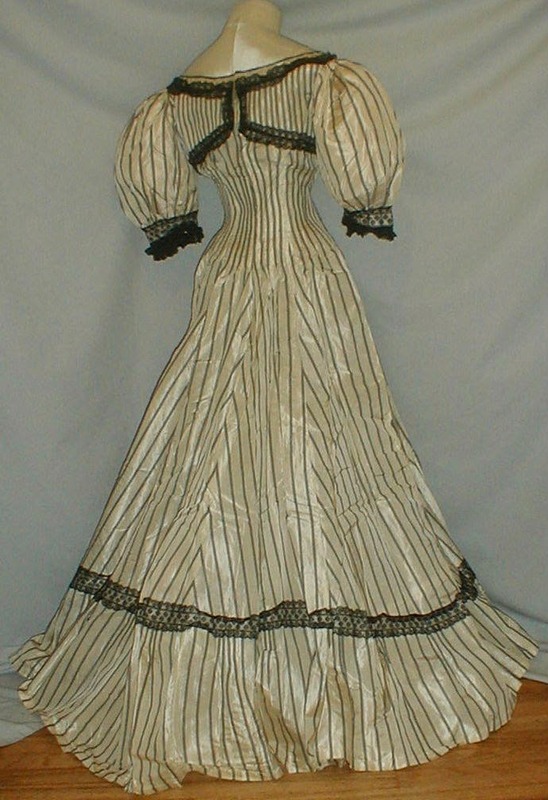 I adore the fabric, used to great advantage with the clever use of darts to "shrink" the stripes closer together. It visually accentuates the waist too. The easy way to remember the difference is that in the 1890's, the sleeves go up! 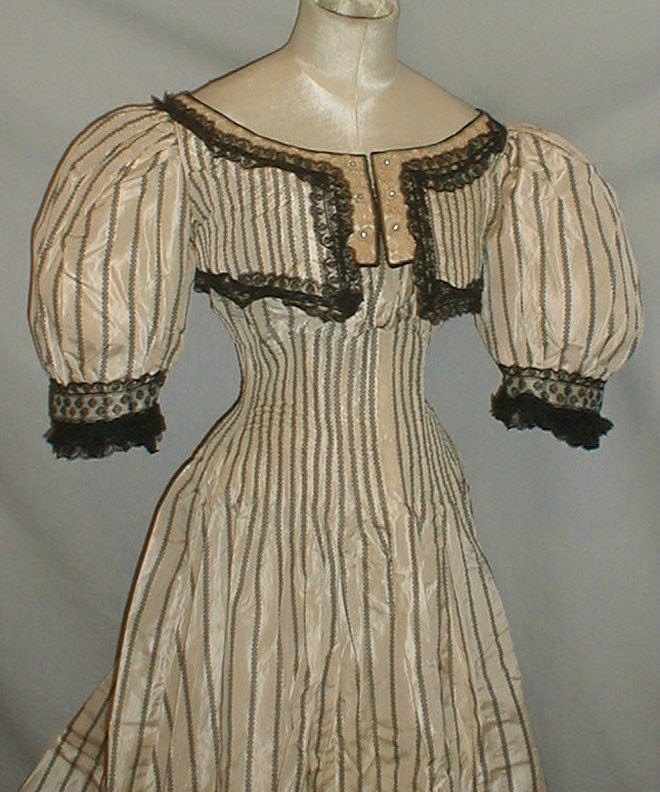 :-) Also, the 3/4 sleeves are almost never 1890's. I know - this one is definitely Edwardian. I've noticed that whenever sellers mis-date something on eBay or Etsy, it seems to be always too early, never later... I guess older items "justify" higher prices!